Why Has Your Spotify Music Stopped? Spotify doesn’t let you stream tracks from its database by using more than one computer or mobile device at a time. Although you can actually log into Spotify from multiple devices, if you try to play music from one connection when another already has music playing, Spotify pauses playback on the first connection. The message Spotify Has Been Paused because Your Account Is Used Somewhere Else may appear if you have an installation for which you selected the Remember Me check box on another computer that someone else is using. So, you haven’t technically logged out, and in some cases, Spotify may think that you’re still playing music on this connection. Pressing play on your current connection should reverse the situation and resume play on your own computer or device. In some cases, your account may have been compromised if someone has discovered your password. If you’re certain that this is the case, you can reset your password. Note that the person who’s using your password can still access your account if she’s logged in — at least, until the next system upgrade that forces her to reenter the account details. 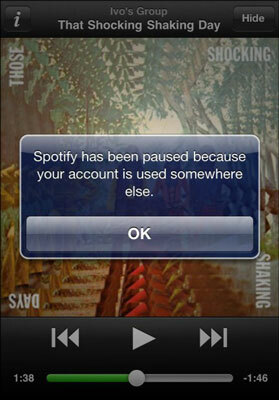 Spotify says that it updates its software every two to three weeks.